Rather than trying to revive the typical unreliable strips and trays, the founders created a collection of teeth whitening products that deliver visible, effective results and use safe ingredients rather than harsh abrasives. Home teeth whitening with this brilliant brand offers a real experience; as the brand slogan states - ‘Don’t just whiten your teeth, Luster!’ The brand is even being championed by the fabulous Binky Felstead from Made in Chelsea, who represents as the ambassador - and who wouldn't want a dazzling smile like hers?! 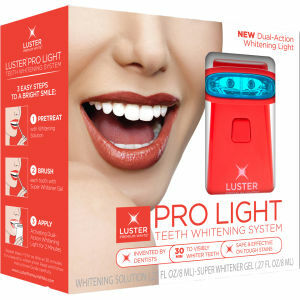 For a difference that you can really notice, it doesn't get much better than teeth whitening products from this genius brand, so get yours now with free delivery options here at BeautyExpert.com!